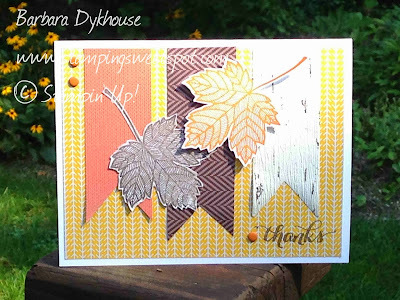 Stamping Sweet Spot: Welcome, Fall! Good morning, and happy Saturday! If you are anything like me, you probably have a cup of coffee in your hand. Or maybe it is your second cup! Personally, I need two cups in the morning, one for each leg! Here is the Utah Diva's sketch for September 21, UDISC259. You can find all of the cards and designers here. This was another busy week for me, so I again took my inspiration from things that were already out from other projects. Here's my version of the sketch. What do you think? I am just in love with the beautiful birch paper in the Thankful Tablescape Simply Created Kit. It comes on a roll, and there is a lot of it! I'm off to a busy Saturday. My youngest daughter and her husband just bought their first house and today is move in day! I'll be there to help out, at least for a good part of the day. I am so excited for them! Thanks so much for stopping by. Comments are always welcome and appreciated. Have a wonderful first weekend of fall! Gorgeous, Barbara! Have fun moving your daughter today! Beautiful fall card! Be careful today! Beautiful fall card!!!! Be careful today!